Whale watching from the small fisherman’s village Gansbaai near Hermanus, was an amazing experience. We saw the Marine Big 5; Whales, Sharks, Seals, Dolphins and Penguins on an African Seafari going to sea with Dyer Island cruises. We have been traveling the world together for years and are finally doing an extensive trip of our home country, South Africa! Our trip around the Western Cape kicked off with a Big 5 experience with a difference – doing whale watching during a Marine Big 5 Safari from Kleinbaai harbour near Gansbaai. Most people know the Big Five; lion, leopard, buffalo, rhino and elephant so what is the Marine Big 5? During a Marine Big 5 safari you are out to see Great White Sharks, whales, seals, dolphins and African Penguins. The cold Benguela current bringing nutrient rich water from the Atlantic Ocean converge with warm water from the Indian Ocean brought by the Agulhas current. This phenomenon results in the incredible biodiversity found around Africa’s southern tip building up an extraordinary ecosystem from tiny plankton to massive predatory fish. We were lucky to be hosted by Dyer Island Cruises, an extremely professional and experienced, eco-friendly outfit, offering us an excellent chance to spot these beautiful animals. The biggest animals on the planet are on top of the list. The town Hermanus, 2 hours drive from Cape Town, is often referred to as the whale watching capital of the world and definitely the place to go for whale watching South Africa. Boats usually launch from the quaint fishing harbour of Gansbaai. Three whale species are commonly seen on these expeditions; Southern Right Whales, Brides Whales and Humpback Whales. The Southern right whale draws most tourists to the area. They are found along the coastlines in South Africa between July and December. These whales migrate from the Antarctic around June to calve and mate which takes place in August and September. The population peaks when the males arrive for mating in October. 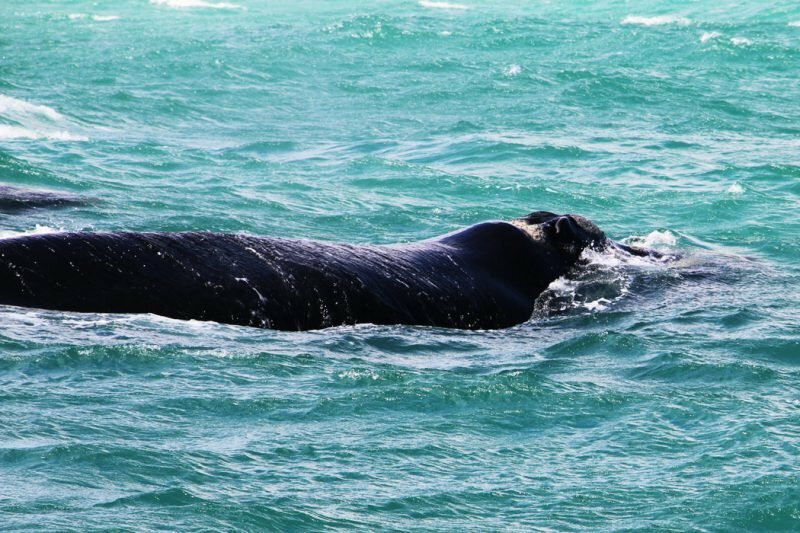 Southern right whales can be identified by the callosities on it’s head, and lack of a dorsal fin on it’s back. Adult whales are between 14-16m in length and can weigh between 40-60 tonnes. 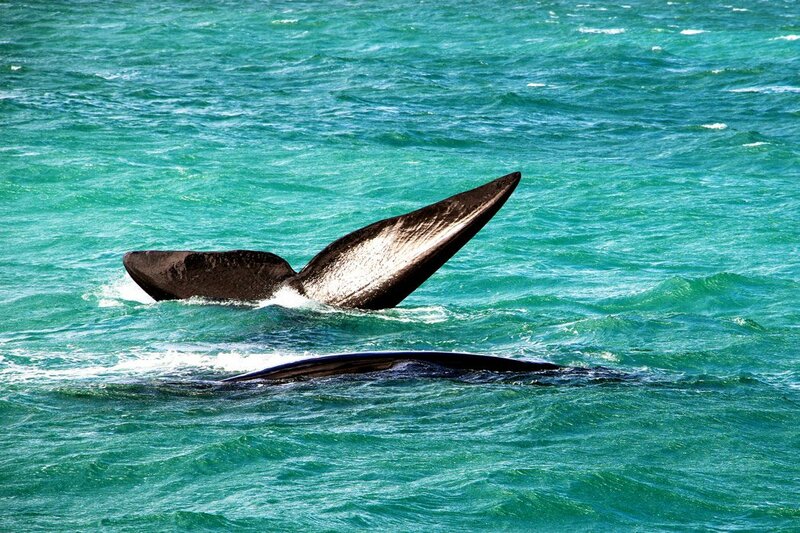 The Brydes whale is a smaller whale species found in the Walker Bay area. These whales are, estimated at 10.1 to 11.6 m (33 to 38 ft) in length. These deep diving animals are difficult to see, usually they dive after surfacing briefly, staying down for up to 20 minutes. Bryde’s whales are found in the Dyer Island area throughout the year, with most sightings occurring during the summer months. Humpback whales are commonly seen between June and August while these animals are migrating to the warmer Indian ocean. They are easily recognizable by their long flippers, humped back with a dorsal fin, and the distinctive white markings on the underside of tails. Humpback whales grow up to 16m and 30 tons. In season whales can be seen from shore in the area. The cliff paths of Hermanus offer an excellent vantage point to view the whales. This is a good budget option, but obviously your chance to see these magnificent animals are much lower. It is fun to hear the horn of the whale crier and run to the edge of the cliffs to see the whales! 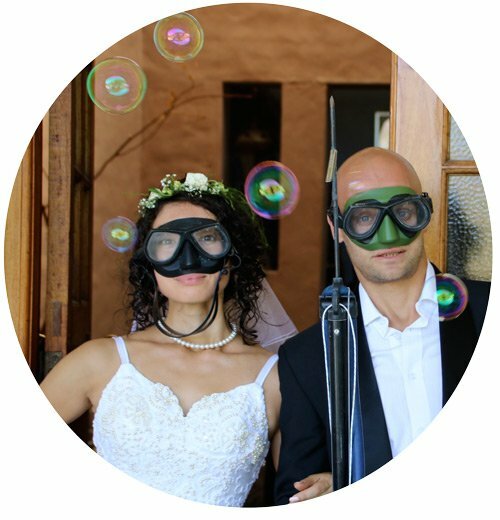 When you mention diving in South Africa many questions regarding sharks always come about. Cage diving with Great White Sharks is a very popular bucket list activity for many adventurous tourists. During a Marine Big Five trip with Dyer Island Cruises the boat takes you to the famous ‘Shark Alley’. At this location between Dyer Island and Geyser Rock, they stop next to sister company Marine Dynamics doing cage diving. If there are Great white sharks around you have an excellent chance of seeing these top apex predators from the boat. Bronze whaler sharks also sometimes surround the cage diving boats. The sharks are not fed, they are lured to the boat with a scent trail, the “chumming” consists out of a bait bag containing fish products. Bronze whaler shark swimming close to the cage at shark alley. Dolphins are often seen on the expeditions and if you are lucky you can be surrounded by massive pods of dolphins. Humpback dolphins and Common dolphins are the species most often seen in Walker Bay. This is one of the Marine Big 5 you are basically guaranteed to see on a whale watching Hermanus expedition! There are about 60 000 of these curious, playful animals living on Geyser rock, next to Dyer Island. They often swim and play around the boat making for good photo opportunities. There is a colony of 60 000 Cape Fur Seals on Geyser rock neighboring Dyer Island. The African penguin is the only penguin species that breeds in Africa. They breed mainly on offshore islands in colonies and Dyer Island is one such a breeding area. Breeding season begins in January and African penguins mate with the same partner year after year. Unfortunately these guys are in trouble with a 90% population decline on Dyer Island in the last 30 years. There are many reasons, but a big one is guano harvesting, bird poo is awesome fertilizer for your garden and tons of it was scraped from Dyer island to be sold to gardeners. Penguins used to burrow nests in the guano layer that was meters thick, without this protective layer they are exposed to the sun and predators. Want to save a Penguin’s life? 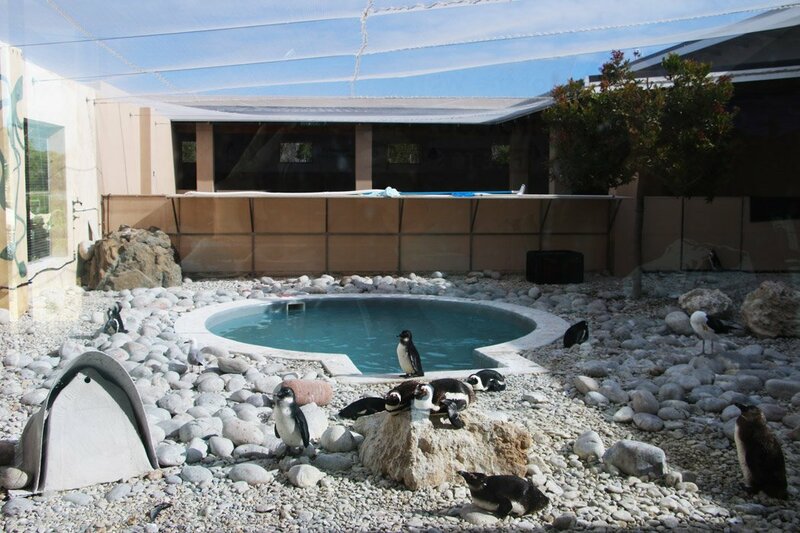 The African Penguin and Seabird Sanctuary (APSS) in Gansbaai provide temporary rehabilitative care to diseased, displaced, injured, oiled and abandoned marine birds, focusing on the endangered African penguin. Feeding of the penguins in the center is everyday at 15:00. It is nice place go after your seafari, sit and watch while enjoying excellent cake and coffee. The APSS is a project driven by the Dyer Island Conservation Trust (DICT) together with Marine Dynamics and Dyer Island Cruises. The main sponsor is Volkswagen. Waiting for the feeding while listening to a talk on penguin conservation at the African Penguin and Seabird Sanctuary in Gansbaai. On the left you can see a specially developed penguin shelter such as placed on the island. We saw many birds on our whale watching trip, including Gannets and several different Comorant species. After launching we started heading towards Dyer Island, about 8km off shore. Somewhere close to Uilkraalsmond, we found a mother and calf pair of Southern Right Whales. They were cruising the area, spending a lot of time on the surface playing in the swell. This created a lot of opportunities for taking photos. The whales showed us a lot of flipper and some tail when they were frolicking and diving in deeper water. Unfortunately we did not see them breaching. They were not shy at all and we saw them again playing on our way back to the harbor. The morning group also saw a pair of humpback whales and a pod of dolphins. The Cape Gannet is one of South Africa’s largest sea birds. 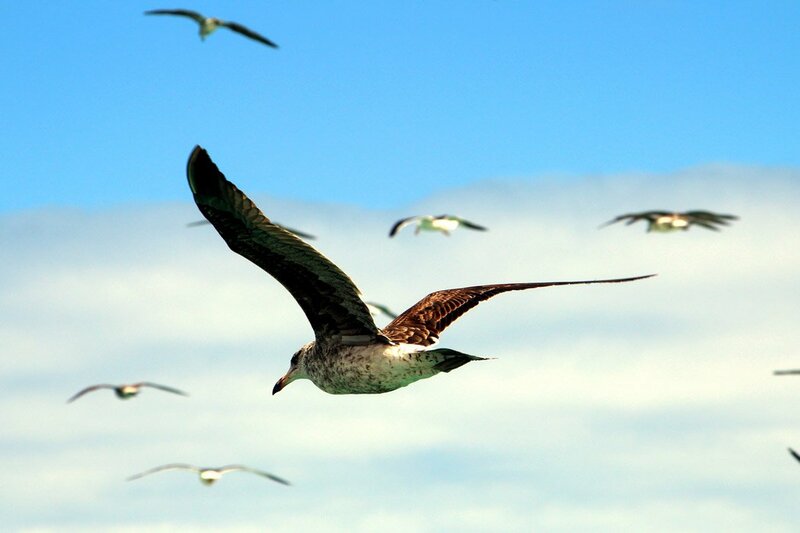 It is awesome to see these birds plunge into the ocean when hunting! 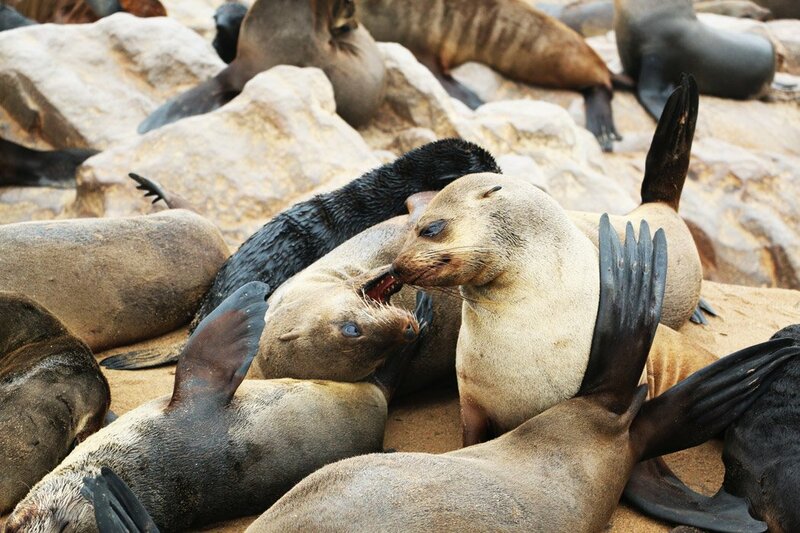 We left the whales and continued to Dyer Island to see the Cape Fur Seals. There were thousands on the island and a couple of seals playing around the boat. On the way, we spotted some African Penguins in the water. On our way back in we stopped next to the Marine Dynamics Shark Cage Diving boat. Due to the presence of Killer Whales (orcas) in the bay, the Great White Sharks disappeared for a couple of days. There were however a couple of fairly large Bronze Whaler sharks entertaining the divers in the cage. The Whale Watching Trip duration is between 2 and 3 hours, depending on sightings and weather conditions. Dyer Island Cruises and Marine Dynamics cruises depart from Kleinbaai harbour near Gansbaai. We had an fantastic trip. The onboard marine biologist was knowledgeable, there was some swell and strong wind, but the crew did a good job of assisting the one or 2 seasick clients. The trips depart all year around. If you are in the Cape between July and December do not miss the opportunity to see the incredible Southern Right Whales! This is a sponsored post all opinions are our own. 25 photos of Argentina that will blow your mind! What an amazing place and experience. Love South Africa!! Hi, Nancy! Yes, whale watching is a fantastic experience! We’re glad you love our country!